To create an awareness on the menace of drunken driving, we help the parent department in distributing pamphlets all over Chennai. 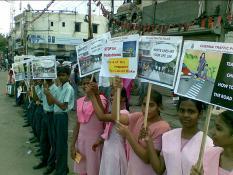 A similar project, this time to create an awareness among people who walk on roads. In order to encourage two wheeler riders’ to always wear helmet during the ride, about hundred traffic wardens’ had conducted a helmet rally covering almost all parts of Chennai. Dear corporates, invite our expert team to your office for awareness presentation! Click here and enter your information - one of our representatives will contact you shortly.